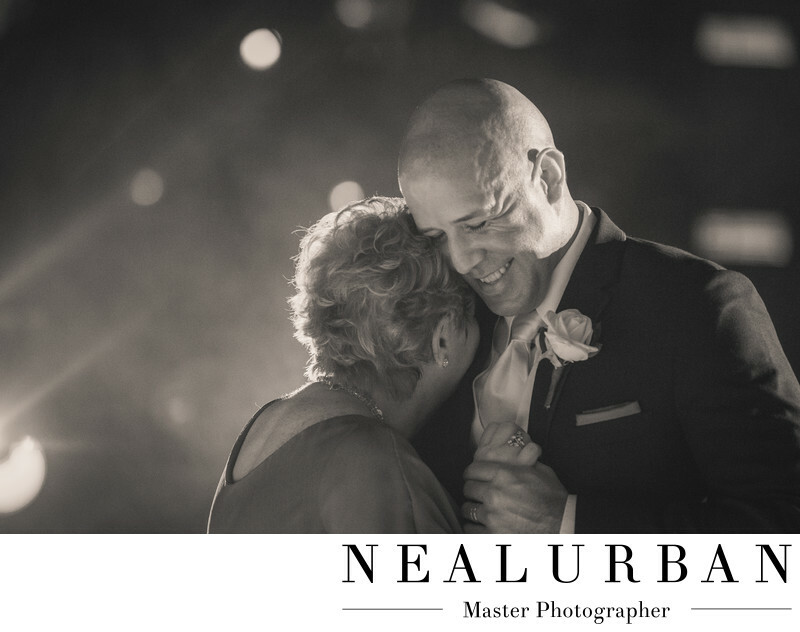 Mother and son, and father and daughter dances can be so emotional. We have even had mother daughter dances as well! We think this is one of the most emotional parts of the day. This image of Joe and his mother is beautiful. His mother started to cry and Joe was holding back. He was trying to make her laugh. His expression is priceless with that smile. Neal did set up some off camera flashes for the dances. Paired with the boca lighting, this image turned out beautiful. While Neal is usually taking more artistic images, I am focusing on more up close images and reactions. Sylvia and Joe had a destination wedding in Puerto Vallarta Mexico. The ceremony was in the middle of the town called Our Lady of Guadalupe Church. For photos, we left the church and walked around the area with the wedding party. The reception was at the NOW Amber Resort. The reception was on an outdoor area of the resort. There was a large area that was set up with tables and gorgeous center pieces. The dance floor was huge. There were also a bunch of string lights strung above the dance floor. All of the wedding guests were from different parts of the world. Sylvia grew up in Mexico, so a lot of her family was from that area. Sylvia and Joe live in Dallas, TX. There were some different events that went on that we were not used to back home in Buffalo. Instead of a bouquet toss, the bride's flowers were locked in a glass case. Then there were a bunch of keys that all of the single ladies pick from in hopes they can unlock it! We love being able to take part in new and different cultures. We get so many different style of images and learn new things. This image had to be edited black and white. The emotion on the grooms face is so timeless! Location: Calle David Alfaro Siqueiros No. 164, Zona Hotelera Las Glorias, 48333 Puerto Vallarta, Jal., Mexico .